Blog How is Middle Distance Swimming Related to Oxygen Uptake Kinetics? 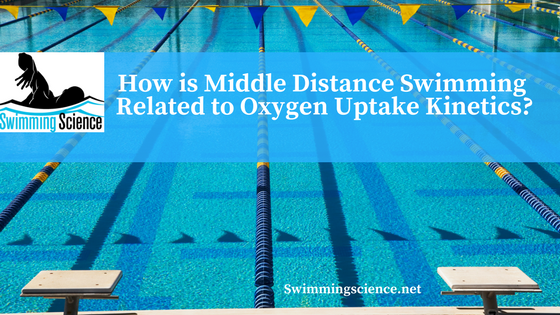 How is Middle Distance Swimming Related to Oxygen Uptake Kinetics? Middle distance swimming is a unique blend of anaerobic and aerobic exercise. This mix of moderate to high intensity requires coordination between the cardiorespiratory and muscular systems. It is believed the faster VO2 kinetics and reduced amplitude of the slow component are highly correlated with higher levels of aerobic fitness, improving fatigue tolerance. Unlike other sports, VO2max and swimming performance has a mixed correlation. Swimming efficiency seems to have a better predictor of swimming performance than VO2max, especially in middle distance swimming. One reason VO2 max does not directly correlate as it is possible that constraints in blood flow/oxygen transport and/or greater respiratory work during swimming could be responsible for important differences in VO2 kinetics from those that have been reported for upright exercise. These researchers looked to determine the extent to which VO2 kinetics parameters measured during square-wave transitions from rest to high-intensity swimmer exercise are related to middle distance swimming performance. Fourteen highly trained swimmers performed 3 testing sessions with at least 24-hour rest. The investigators dictated the speed via acoustic feedback at every 25th meter. The cardiopulmonary analysis was performed through a snorkel and the K4b2 system. Blood lactate and heart rate were recorded. The swimmers first performed 5×200 meters with 30 seconds rest to exhaustion to determine both the ventilatory threshold and maximal oxygen uptake. The speed of the first 200 was 60% of personal best 200 meters with 5 – 10% increments between 200s with the fifth being maximal speed. The single best predictor of performance of the variables assessed was VO2 kinetics. The main finding was VO2 kinetics of the primary phase were associated with performance during high-intensity swimming. Specifically, time constant 63% during heavy and severe-intensity transitions was positively correlated with the time to complete the 400 meter. This suggests VO2kinetics is the best predictor of performance for middle distance swimming performance. The velocity at which the swimmer can increase oxygen consumption a few seconds after the beginning of high-intensity exercise seems to be important in middle distance events. This study does not look at training methods to improve VO2 kinetics, therefore practice applications are required to determine which influence VO2 kinetics for middle distance freestyle. Reis JF, Alves FB, Bruno PM, Vleck V, Millet GP. Oxygen uptake kinetics and middle distance swimming performance. J Sci Med Sport. 2012 Jan;15(1):58-63.